The Toyota Hilux now looks like it could snap the annual win off the Isuzu D-Max. 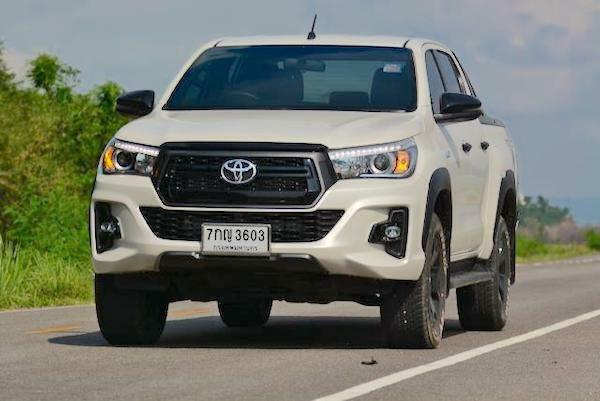 The Thai new vehicle market continues to align outstanding results month after month with September up 14.3% to 88.706 units marking the 13th consecutive month of double-digit gains. The year-to-dat tally now stands at 746.584 registrations, up 20.3% on the same period in 2017, still on track to break the million annual sales milestone for the first time since 2013 with BSCB estimates still putting the 2018 Thailand market around the 1.050.000 mark. Toyota (+39%) continues to catch up on lost time, almost tripling the market growth to hit 32.4% share, its highest since November 2016 (36.3%) after a low of 23.6% in August 2017. Isuzu (-22%) is struggling to 14.7% share vs. 16.8% YTD with Honda (+6%) now menacing at 12.7% in September. The remainder of the Top 7 all outpace the market, led by Mazda (+33%), Mitsubishi (+28%), Ford (+22%) and Nissan (+21%). But it’s Chinese MG (+81%), recently graduated to local producer, that remains the best performer in the Top 10, albeit down to 2% share vs. 2.4% so far in 2018 (+108%). Over in the models ranking, the Toyota Hilux surges 68% year-on-year to sign a 5th consecutive win, something it hadn’t achieved since December 2016, hitting 16.5% share which is also its highest since December 2016. After outselling its archenemy the Isuzu D-Max (-27%) by 131 units in May, 1.939 in June, 1.032 in July and 1.632 in August, the Hilux’s advantage is a gargantuan 4.160 units this month, reducing the gap separating its from the #1 YTD spot, still held by the D-Max, to just 2.288 (105.321 vs. 103.033) with three months remaining in 2018. If last month a Hilux annual win seemed uncertain, it now looks like a logical ending to a tumultuous 2018. The Ford Ranger (+34%) grows comfortably faster than the market to cement its third position overall, distancing the Mazda2 (+33%) and Toyota Yaris (+180%). Further down, the Nissan March (+57%), Honda HR-V (+49%), Suzuki Swift (+43%) and Nissan Almera (+40%) impress. The Toyota C-HR (#16) tops recent launches (<12 months) above the Mitsubishi Xpander (#20) up 9 spots on August and the MG ZS (#21). Full September 2018 Top 30 All-brands and Top 70 models below.